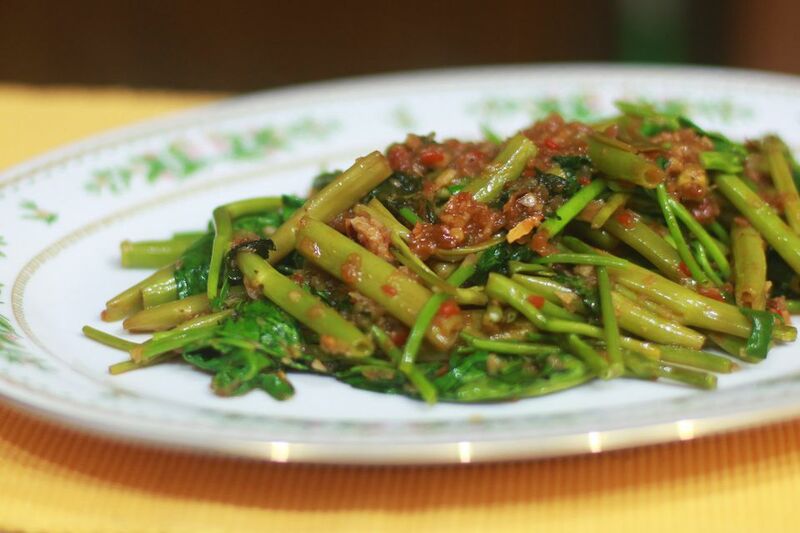 Kangkung is Ipomoea aquatica, a semiaquatic plant that grows in swamps. It is called kangkong in Filipino, rau muống in Vietnamese, phak bung in Thai and kangkung in Malaysian and Indonesian. Both the hollow stalks and the leaves are edible although the stalks are tougher and take a bit longer to cook. Sambal is a generic term for chili-based sauces; there are a lot of varieties, we suggest using sambal oelek (available in the Asian section of most groceries). If you use sambal belacan which is a chili and shrimp paste, you don’t have to add shrimp paste separately, but you’ll probably have to make adjustments to the amounts. You can serve this as a vegetable dish alongside a meat dish. It’s not totally vegetarian because shrimp paste is an ingredient; if you want to transform it into a vegetarian dish, just omit the shrimp paste. Cut the kangkung into two-inch lengths. Separate into three portions—the thick lower stalks, the middle portion of the stalks and the leaves. Grind the onion, garlic and lemongrass to a paste (a mortar and pestle are traditional, but you can also use a food processor). Heat the cooking oil in a wok or frying pan. Add the onion-garlic-lemongrass paste, grated ginger, tamarind paste, shrimp paste, sugar, sambal oelek (or chilis, if that’s what you’re using) and about a teaspoonful of fish sauce. Cook gently over medium heat until the mixture separates from the oil. Add the kangkung stalks—the thick ones. They take the longest to cook so they go into the pan first. Stir. Pour in about three tablespoonfuls of water and cook for about two minutes. Add the middle portion of the stalks, stir, cook for a minute. Add the kangkung leaves, stir and cook for about half a minute. Taste, add more fish sauce if needed and serve hot.